according to the baton rouge, la. morning advocate, louisiana state university asked the piyush "bobby" jindal campaign to cease and desist from using lsu colors together with the word "tigers" in some of its campaign materials. 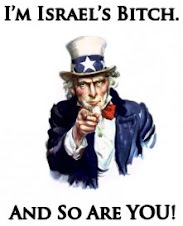 melissa sellers, a spokeswoman for piyush, who casts himself as mr. ethics "said that jindal will continue to distribute the tiger bumper stickers." LSU and U.S. Rep. Bobby Jindal’s gubernatorial campaign are at odds over the purple and gold “Tigers for Jindal” stickers cropping up on car bumpers. LSU Chancellor Sean O’Keefe said Tuesday that the Jindal campaign agreed to stop distributing the bumper stickers after watchdogs of the university’s franchising and brand raised the issue of the campaign using the school’s colors and mascot. “It is an identifier with LSU,” O’Keefe said. O’Keefe said LSU polices the use of the university’s colors and mascot because they are so closely associated with the school. LSU is not singling out Jindal, he said. Jindal, R-Kenner, did not respond Tuesday to interview requests made in a phone call and four e-mails. 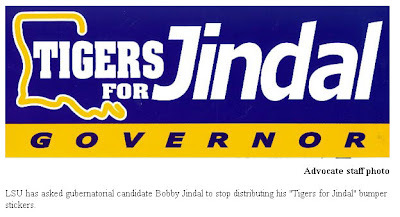 However, his campaign press secretary, Melissa Sellers, said Jindal will continue to distribute the Tiger bumper stickers. She did not respond to further questions about the issue. The primary election is Oct. 20. LSU’s objection stems from the combination of the word “tigers” and the purple and gold, said Eric Monday, associate vice chancellor for finance and administrative services. “LSU doesn’t take exception to the use of the colors in and of themselves. It’s the use of the colors and one other element such as the word ‘tiger’ or ‘tigers,’ ” he said. Monday said he thought the Jindal campaign agreed to stop producing the bumper stickers. “We’ll have to have another conversation with them,” he said. Jindal is not the first candidate to put his name on a bumper sticker using LSU’s mascot and colors, Monday said. Suzanne Haik Terrell handed out “Tigers for Terrell” bumper stickers when she ran for public office several years ago, he said. Terrell ran for the U.S. Senate in 2002 and for state attorney general in 2003. Her campaign agreed to stop distributing the stickers at LSU’s request, Monday said.